At Rockford Construction, our team members wear many hats. We are constructors, property managers and real-estate developers, continually striving to redefine what we can do and who we can be for our clients. As we take on new challenges, one role remains a priority: Above all things, Rockford Construction is a neighbor. To think of a building or initiative as not standing alone, but as an integral part of a greater purpose — one that aims to give every individual a space to thrive — is the responsibility we take on as members of our communities. Being a good neighbor requires an understanding that every individual has the potential to create a significant and positive impact. As a construction company and a team, this potential multiplies. Neighborly acts take shape as an annual holiday party for the neighborhood elementary school, a grocery store filled with fresh produce and local goods, shelters for people in need and stunning apartment buildings for community members to call home. Throughout these endeavors, our success relies on our ability to listen to the needs of the community before acting and making the space for those ideas to be heard. Our community banner allows team members to share their vision for the communities in which they work, live and play. 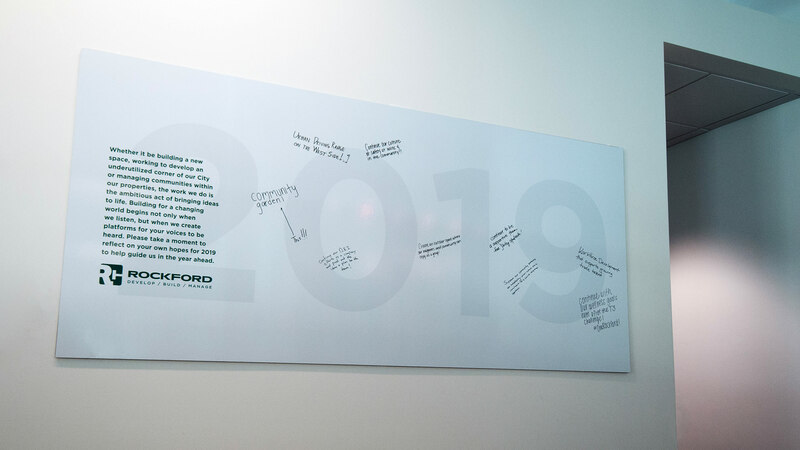 Launched in January of this year, Rockford’s community banner allows team members to share their vision for the communities in which they work, live and play. The banner’s location in the front of the office encourages team members to take a moment to write down their idea and read the thoughts of others. Whether it be an urban garden or warming centers for the homeless, the banner provides a space for these ideas to be seen and spark inspiration for how we as a company can grow in our service. The banner stands as a reflection of Rockford’s commitment to fostering a culture of service that energizes team members to think critically about what they can do to uplift organizations and neighborhoods close to their hearts. As the year progresses, the banner serves as a reminder that the work of elevating the communities we serve never ends. Beyond the incredible work that has already completed, and the hundreds of service hours already put in, there are still gaps where we as a company and as individuals can use our time and resources to fill. By handing someone a pen and a banner to write on, we begin a meaningful conversation – a conversation that starts with listening and ends with action, one that takes an idea and transforms it into a beautiful outcome.